This last weekend we competed in the 2014 Patos Island Classic -- this annual event consists of three courses - a day, short & long courses. 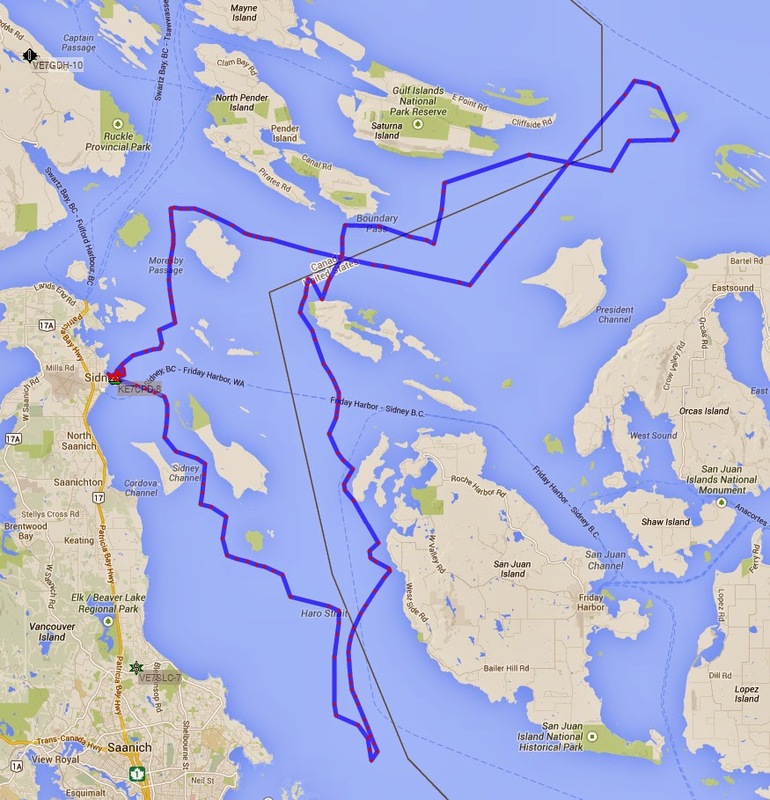 We competed in the long course which starts off Sidney Marina and heads south down Haro Strait to Beaumont Shoal, then north around Turn Point (Stuart Island), then up Boundary Pass, around Patos Island (any way), back down Boundary Pass, around the north of Moresby Island followed by a finish off Sidney Marina. The total length of the long course is 67nm. The winds were predicted to be very light and we anticipated a long sail and were pleasantly surprised by 8-12 knots winds for most of the race which allowed us to finish about 9:00pm in the evening. 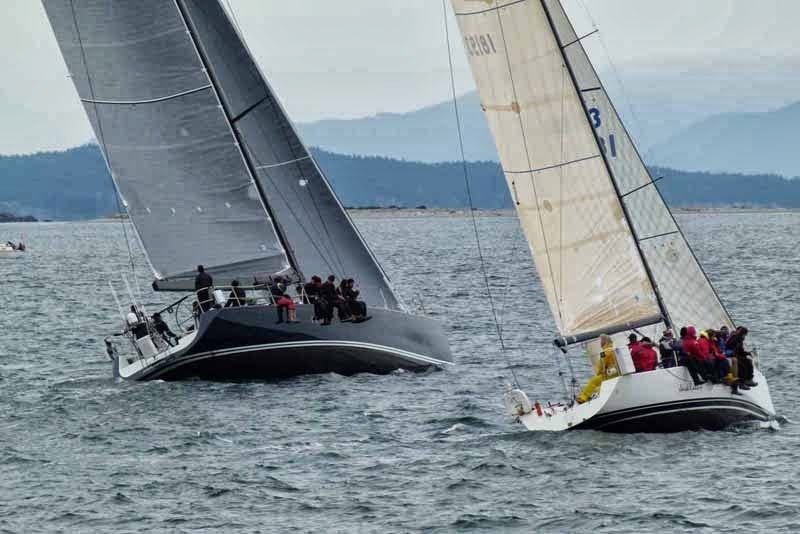 Given the short start line we did a dip start and lead the pack out to Sidney Spit and then tacked south inside James Island down to Beaumont Shoal in a brisk ebb current. On the way our PBO halyard broke so we had to switch halyards costing us some time. Just south of Kelp Reef we headed east and tacked again in the main current river in Haro Strait. Once rounding Beaumont Shoal we set our A2 kite and headed up to Turn Point. As expected we were lifted into San Juan Island where we downshifted to the A1 in a jib set and then proceeded to work the US shore to Turn Point trying to escape the adverse current as best we could. At Turn Point most of the short course fleet was parked on the Canadian Side -- we worked the Stuart Island shoreline for two tacks in adverse current and then gave up and headed over to the Canadian Side. When we got near the Canadian Side a SE wind picked up and we beat up Saturna Island, then crossed over and rounded Patos counter clockwise. After rounding Patos we set the A2 kite and had a long run down towards Stuart followed by a jibe back towards Moresby Island. As we neared Moresby Island we were headed and had to put up a headsail to make it around. At the north end of Moresby Island we put the A1 up and ran all the say down to Sidney in light winds. We expected the winds to shut off but it didn't thankfully and we were able to finish without much drama. In looking back at the race we left a little time on the course in three areas - 1) halyard breakage; 2) the parking lot at the NW corner of Stuart (we probably should have sailed right across); and 3) by rounding Patos counter clockwise - the flood had set in earlier than predicted and we could have spent less time in adverse current had we gone the other way around. The net-net is that we won the IRC division by a wide margin and had we used our historical ratings we would also have won the overall. A nice weekend and season opener!